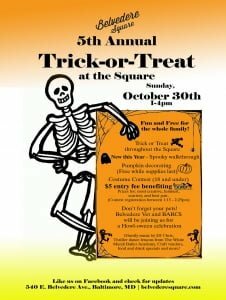 Belvedere Square’s Fifth Annual “Trick or Treat at the Square” on Sunday, October 30th offers a fun-filled Halloween celebration for the young and young at heart. Among the treats for families: music by DJ Chris, a Thriller dance lesson and performance by The White Marsh Ballet Academy, surprises from Square merchants, food and drink specials, a costume contest (18 and under), pumpkin decorating (free while supply lasts), a new scary walkthrough, and more! Even pets are treated by Square neighbor Belvedere Veterinary Center and special guest appearance from the BARCS BFF Waggin. Ghosts and goblins welcome! The event is open to the public and all activities are free, with the exception of the costume contest, which has a $5 entry fee. 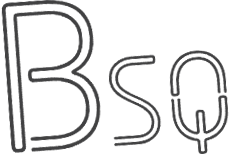 100% of the proceeds from the contest will benefit the Baltimore Animal Rescue and Care Shelter (BARCS). 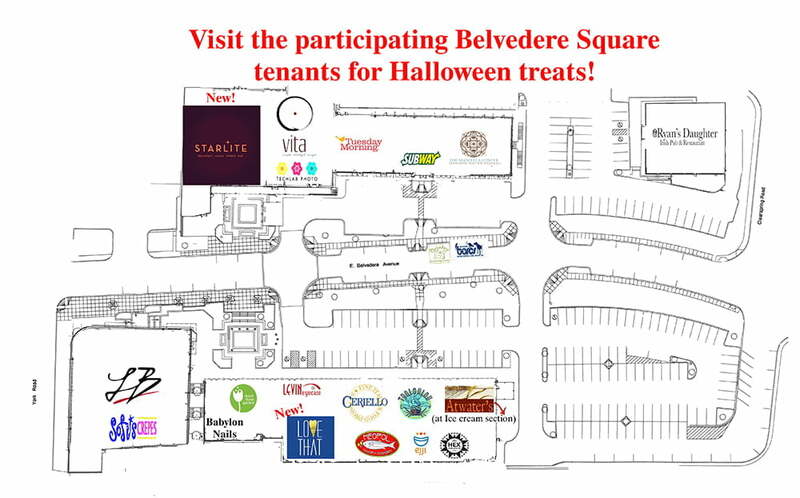 Click here to view and download PDF version of flyer and map. ← Love That and Starlite Diner Now OPEN!